Boasting lovely water views, airy interior spaces and easy access to all the area has to offer, El Rey 2 is your Tybee vacation rentals dream come true. Simply step through the front door to transition from soft sea breezes and swaying palms to light-washed rooms with huge windows. El Rey 2, located on the northeast corner of the island near the mouth of the Savannah River, promises all the relaxation, recreation and rejuvenation you could wish for on your Tybee Island vacation homes getaway. This contemporary condo sleeps four and features two bedrooms, a bath and an open floor plan. When you enter El Rey 2, the fresh, light colors, blonde hardwood floor and beach-themed artwork welcome you with a sense of airiness that immediately whisks away any lingering workaday concerns. Newly furbished with upscale style, the condo exudes tasteful attention to detail. The open living room and kitchen provide communal space where you can spend hours of quality time with your travel companions. Floor to ceiling windows in the living room overlook a peaceful stretch of water and lush green fields. Enjoy the view over morning coffee or casual conversations in the comfort of the overstuffed sofa and armchairs. A flat screen television adds an entertainment option while the adjacent kitchen contains a complete array of amenities to make home-cooked meals more fun. A marble-topped eating bar with comfy seating for four debuts the kitchen, where you will find a dishwasher, range-oven and roomy French door refrigerator. All of our vacation rentals Tybee Island GA feature a generous supply of dishes, glassware, utensils and cookware for you to use during your Tybee vacation rentals stay. You will also find a coffee maker and dish towels for your convenience. Additional premium features you'll appreciate in Tybee Island rental homes are ceiling fans throughout, which let you adjust the air flow to your liking, plus fluffy towels and bedding. All you need to bring are your clothes and toiletries. You'll find two bedrooms in your El Rey condo, one with a king bed and the other with a queen-sized bed. Both open just off the living room and feature their own flat-screen TVs, dressers, night stands with lamps and spacious windows. The bathroom boasts a luxurious glass walk-in shower, a marble-topped vanity, and a compact washer and dryer for your use during your vacation rentals Tybee Island GA stay. 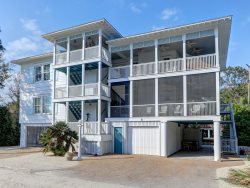 El Rey is in an ideal example of how well-situated Tybee Island vacation homes help maximize your enjoyment during your Tybee vacation rentals holiday. The historic Tybee Island Light Station and Museum are nearby, offering your group the chance to tour Georgia's oldest lighthouse with roots reaching back to 1736. At 145 feet in height, the Tybee Light Station is also the tallest lighthouse in the state. Originally built to help guide ships safely through the mouth of the Savannah River, the Light Station has been repaired and partially rebuilt over the centuries, but still stands as a must-see for Tybee Island vacation homes guests. The adjacent museum, housed in a Fort Screen Battery building, has a wealth of military memorabilia on exhibit that dates from the Spanish-American War through World War II. Three beaches close by offer their own unique attractions. North Beach is accessible from the Light Station parking lot along a short footpath. This shoreline is popular with beachcombers and with birdwatchers visiting the bordering bird viewing area. The nearby Savannah River Beach is a good place to spot dolphins, and the Back River Beach offers views of Little Tybee Island. Vacation rentals Tybee Island GA are typically less than 30 minutes from the center of Savannah along U.S. Highway 80. You and your friends might want to experience one of the historic city's famed ghost tours or enjoy a walk along the riverfront where cargo ships come and go. Be sure to schedule a stop at City Market for a meal and shopping, or take a tour of Savannah's 22 squares. You'll find complimentary bus service within the Historic District, bicycle rentals, trolley tours and even ferryboat excursions. However, you are sure to find enough going on within the community of Tybee itself to fill the lion's share of your days and evenings during your vacation rentals Tybee Island GA stay. The island offers live plays at its own performing arts center, the Tybee Post Theater. You will also find a number of art galleries to browse through. For those who like water sports, kayak rentals, fishing charters, jet ski rentals and even a chance to parasail will probably top the itinerary. Nature trails and bike paths offer land-based adventures too. Be sure to book Tybee Island vacation homes as soon as you know your travel dates to be sure of availability. Get in touch with us at Southern Belle Vacation Rentals to reserve your choice of Tybee Island vacation homes for a memorable beach holiday.